Motherboards from personal computers are one of the most common forms of e-scrap that we see. They have been producing these boards by the millions for almost 4 decades now. When we refer to a "motherboard" we are speaking of the large board inside of a PC computer that holds the CPU. Before we cover the different motherboard grades, it is important to note that ALL batteries must be removed from all of the boards all of the time. 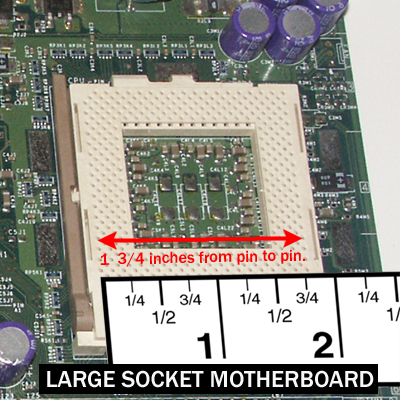 Motherboards are graded by the size of the CPU socket. There are two sizes, "large socket" and "small socket". To determine the size of the socket, we measure the pin area of the socket (not the socket enclosure itself). 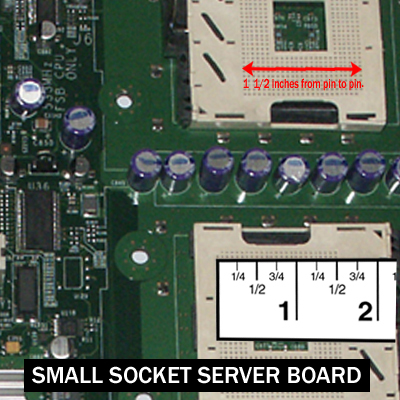 A standard Large Socket Motherboard will have a measurement of 1 and 3/4 inches or more from pinhole to pinhole. Always measure from the pin holes and not the enclosure itself. It does not matter what color the board is or if it is made in China or not. We grade all Large Socket Motherboards the same. Pentium II boards, otherwise known as Slot Processor Motherboards are considered Large Socket Motherboards. They have a slot size of 5 inches. Make sure the slot you are considering is in fact a Pentium 2 CPU slot. Laptop Motherboards obviously are motherboards that are extracted from a laptop. As with any other motherboard, only the large internal board holding the CPU is considered the motherboard. Laptop Motherboards are graded as Large Socket Motherboards regardless of socket size therefor the socket measurements do not apply to Laptop Motherboards. 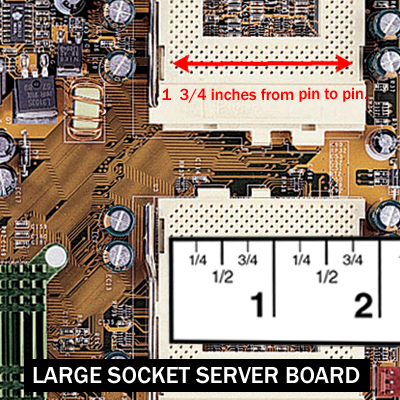 Older PC Motherboards from the 1980's and 1990's are also considered Large Socket Motherboards therefor the socket measurements do not apply to Older PC Motherboards. 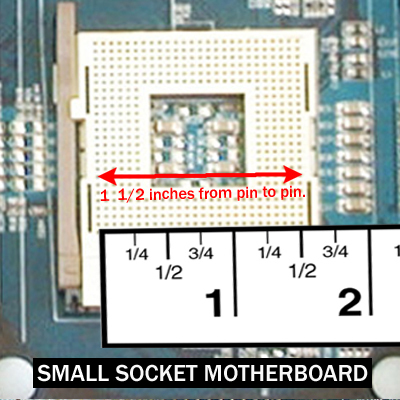 A standard Small Socket Motherboard will have a measurement of 1 and 1/2 inches or smaller from pinhole to pinhole. Always measure from the pin holes and not the enclosure itself. If the board is a P4 or newer, it is going to be a Small Socket Motherboard. Small socket motherboards are sorted by colour, or green. It does not matter what country they are from. 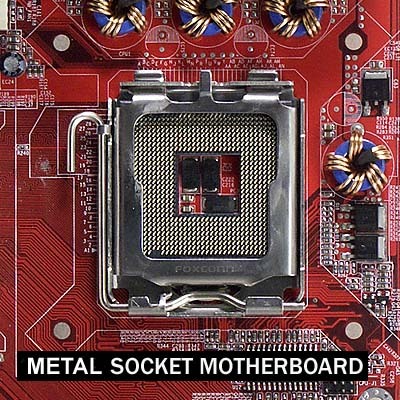 If the socket has a hinged metal enclosure it will always be a Metal Socket Motherboard. These are referred to as "Socket 775". The CPU's that go into those metal sockets are pinless CPUs. A motherboard that has two or more CPU sockets is considered a Server Motherboard and are graded by their CPU socket sizes as well. You will find the same Large -vs- Small rules apply to multi-socket motherboards as they do to single socket motherboards. Do not worry. You will not need to measure each and every motherboard that you sell. Almost immediately you will begin to recognize each grade of motherboard without ever needing to measure. Even though the socket size difference is as little as 1/4 inch, the boards themselves actually look remarkably different. Very soon you will be able to recognize those differences from across the room. 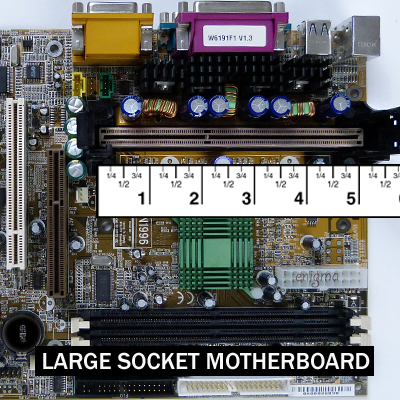 - Motherboards with a socket size of 1 3/4" or greater are considered a Large Socket Motherboard. - Motherboards that host a Pentium II slot processor is considered a Large Socket Motherboard. - Laptop Motherboards regardless of measurement are considered a Large Socket Motherboard. 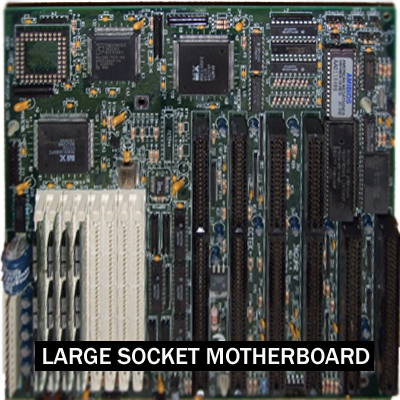 - Old PC Motherboards from the 80's& 90's are considered Large Socket Motherboards. - Motherboards with a socket size of 1 1/2" or smaller are considered a Small Socket Motherboard. - Motherboards with hinged metal CPU enclosure are considered a Small Socket Motherboard. - The Country of origin of the motherboard does not effect the grade. - Multi-CPU Server Boards are subject to the same CPU socket measurement considerations. Last edited by lostinlodos on Tue Feb 12, 2019 4:00 pm, edited 2 times in total. I have a pair of boards that when they are connected together at their sockets make up the motherboard of a Dell laptop with a Pentium II processor. The processor chip and GPU chip were together on a separate board. Would both boards together go as a large socket and the cpu/gpu board since it's green with no metal go as green/brown fiber with no metal? Can you show me a picture example of the smaller cpu board? The laptop board itself will be a Large Socket (because it is of the laptop variety) but I want to be sure that I give you the correct price for the processor board. Thank you. Very helpful post on motherboards. 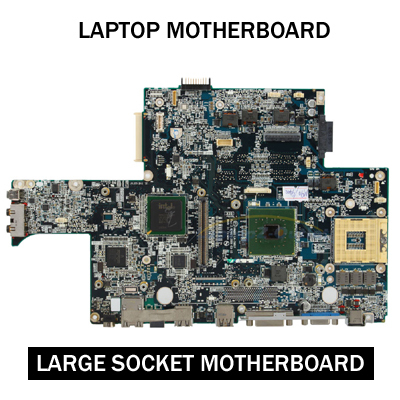 Are laptop metal socket motherboards considered large socket as it says, or do they need to go with the metal socket motherboards? P.S. Thanks for the helpful topic. Hans: post a photo of your board in question in the identification forum and we can look at it. I'm not talking about one specific one, I actually don't have any right now, but would like to know so I can decide more accurately what to pay for them. You wanted a picture, so do different types of laptop metal socket motherboards get different grades, or are they all the same? I understand the grading this way, but when people say low, mid, high, telecom, i start getting a little confused. Any help with better understanding this? What are motherboards that had the gold pins removed grade as? Just getting started so is this a fair price?